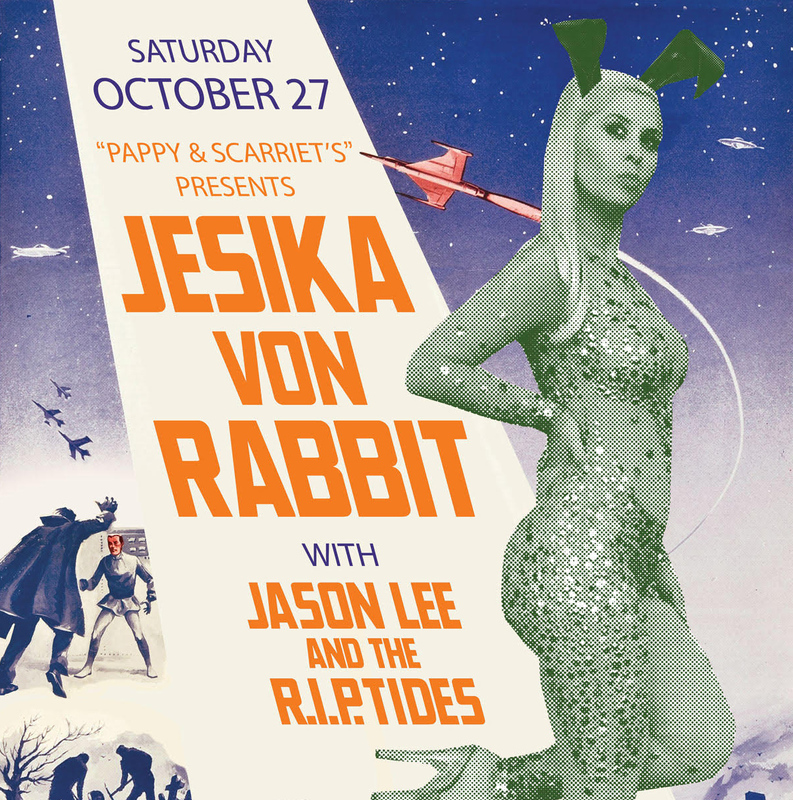 Jesika von Rabbit and Jason Lee and the RIP Tides at Pappy and Harriet’s 10/27 Halloween Show! It’s a HI-DESERT PAPPY & SCARRIETS HALLOWEEN PARTY with Jesika von Rabbit! Previous Pappy and Harriet’s Halloween Weekenders featured her former band Gram Rabbit, this year she fills the stage with her current band and as always her dancers The Grundles for a full visual and auditory Halloween experience! Opening the show will be San Diego’s surf monsters, Jason Lee and the R.I.P. Tides. 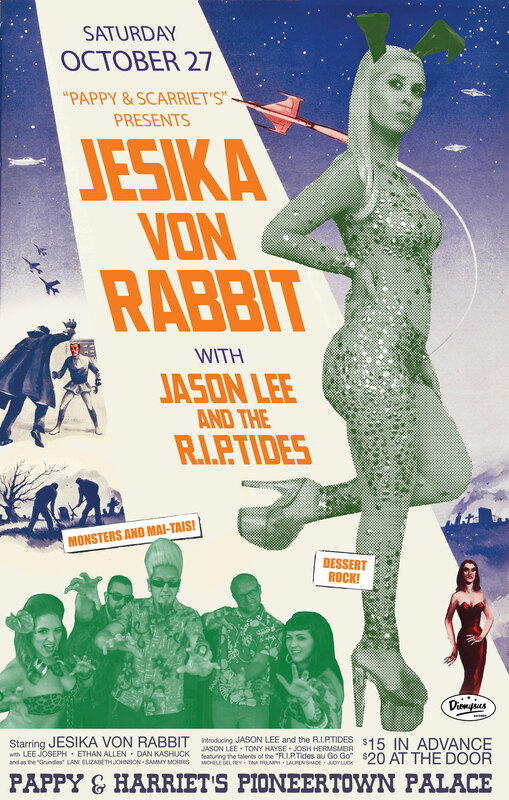 Both Jesika von Rabbit and Jason Lee and the R.I.P. Tides have new releases on Dionysus Records which will be for sale along with plenty of other merch, at the Pappy & Harriet’s lobby. TICKETS ARE ALMOST SOLD OUT, get them ASAP at this link! Thanks to Jason Hall and the Coachella Valley Weekly for this fabulous first review of the new JESIKA Von RABBIT Dessert Rock album out September 14, CD and LP on Dionysus Records, Digital on Royal Order! The Queen of the High Desert, Jesika von Rabbit cordially invites you to the unveiling of her new album Dessert Rock. Enter the whimsical world of Rabbit… Costumes are encouraged as we create a space adorned with desserts, drinks, and dancing girls. 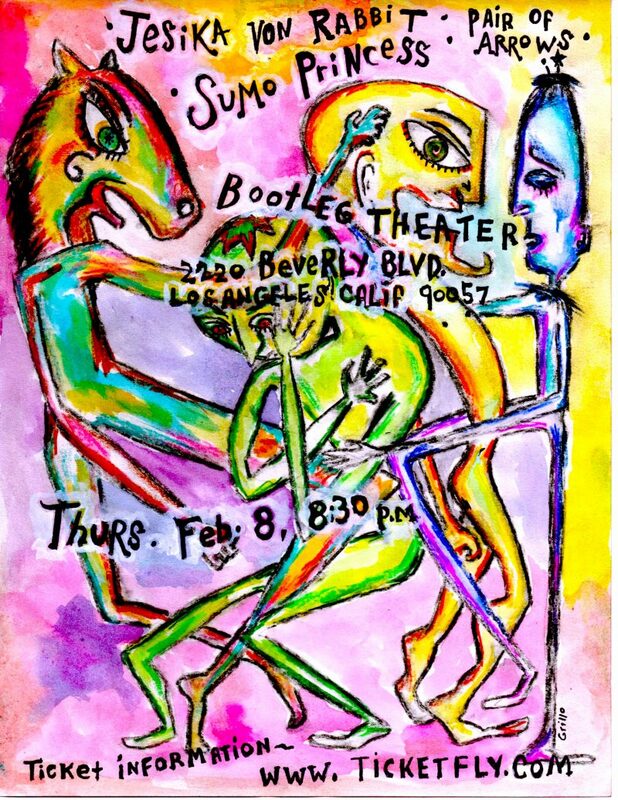 Jesika von Rabbit videos will be playing on a loop, interspersed with projections by visual mastermind Mr. Tamale along with the sweet sounds of Dessert Rock playing all night. Dessert Rock, Jesika von Rabbit‘s second solo album, is an avalanche of appetizing amalgams that incorporate hints of calypso, sci-fi, psychedelic, electro, and funk, and will be available for purchase on both LP (white vinyl) and CD. Digital will be available through iTunes, etc. Freak Out with us on this delightful night, as the Desert meets the City! With her second post-Gram Rabbit solo album in the can, Jesika von Rabbit hops into 2018 with her new songs and band, in Los Angeles, and her hi-desert home-base of Joshua Tree/Pioneertown. Expanding from a two-piece to four with former Gram Rabbit member and Silverlake area producer Ethan Allen on lead guitar, Boston transplant Dan Kashuck on drums and Lee Joseph on bass, the group, including a giant rabbit and dancers masked as former and current presidents, took the crowd by storm at last fall’s Desert Daze festival. Two New Creepxotica Releases OUT NOW Plus Summer ’17 News! Creepxotica, the exotica alter ego of San Diego’s The Creepy Creeps announce TWO new releases on Dionysus Records. Swinging Sounds from Beyond the Nether Regions is the second full-length LP and Creepxotica featuring Rachel DeShon is a 10″ EP paying homage to Peruvian/Hollywood exotica queen Yma Sumac. Both vinyl releases were cut at HRS in Culver City, CA on a vintage Scully lathe using a classic updated Westrex 3D stereo cutting head powered by a tube pre-amp. The vinyl releases include a code for free digital download. Distribution by ILD. If you don’t want a record get digital at iTunes, Amazon, etc. or stream from Spotify, Pandora, etc. Check out this Creepxotica/Creepy Creeps interview in the San Diego Reader! Get records from finer record shops & mailorders, direct from the band at their shows, or from Dionysus Mail Order – links below! The Creepy Creeps are currently working on a new album! Swinging Sounds from Beyond the Nether Regions is Creepxotica’s second full-length LP. 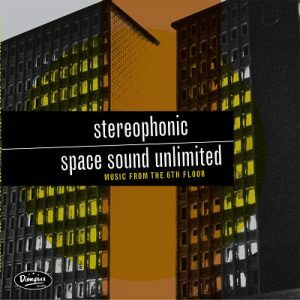 Inspired by the sultry and strange sounds of the Middle East, Asia and Europe as well as Spaghetti Westerns, surf, exotica and psychedelia, this, their second LP, features longer tracks dedicated to an expansive exotic, haunted musical terrain. What began as the “Yma Sumac, the Legend, the Woman the Music” symposium at Tiki Oasis 14 featuring “educator” El Vez (aka Robert Lopez of The Zeros) with Seattle opera singer Rachel DeShon and San Diego’s Creepxotica, has resulted in this extremely off-the-charts 10″ vinyl exotica “tribute” to the Peruvian/Hollywood exotica goddess. Lopez saw an opportunity to pair the multi-octave DeShon with Creepxotica as part of his talk about the legendary Sumac. The rehearsals and symposium went so well, it was decided that the group would record tracks for DeShon to sing on. And here they are — five mind-bending exotica fueled psychedelic-tinged tracks with DeShon’s insanely beautiful and confident vocals. Side A of this record are all Mambo! era Sumac covers the likes of which you’ve never imagined performed by anyone but Yma herself. Side B contains two absolute killer Creepxotica originals with DeShon’s vocals bringing them to new dimensions. 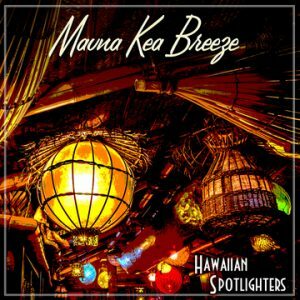 The Hawaiian Spotlighters Manua Kea Breeze LP (Bacchus Archives) – Super rare private pressing ’60s exotica holy grail, lovingly restored and reissued. In 1964, Al Pabilona Sr. Recorded his musical family inside their garage in Hayward, California. Each family member played an integral part of the band. A reported 200 copies of the original album were made by the Century Custom label, a vinyl manufacturer that catered to private pressings. Today, only a handful of these exist, making this one of the rarest exotica records ever recorded! Robert Drasnin Voodoo III – LP/CD/Digital: The final chapter in the Voodoo Trilogy by famed TV/Film composer and exotica legend Robert Drasnin. Back Catalog Spotlight – Special Price! 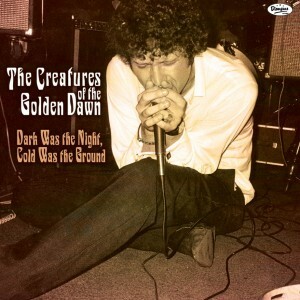 Arriving after the ’80s garage/psych revival, Bethlehem’s Creatures of the Golden Dawn came on the scene with a lot more attitude than did earlier similar-minded combos. Lead by vocalist Mark Smith – their knife-sharp punky garage-meets-the-early-days-of-psychedelia tunes were filled with hooky riffs and always shadowed by varying degrees of darkness. The Creatures amassed a cult following in the States and Europe, and were played heavily on Little Steven’s Underground Garage syndicated radio show. Join the fun! 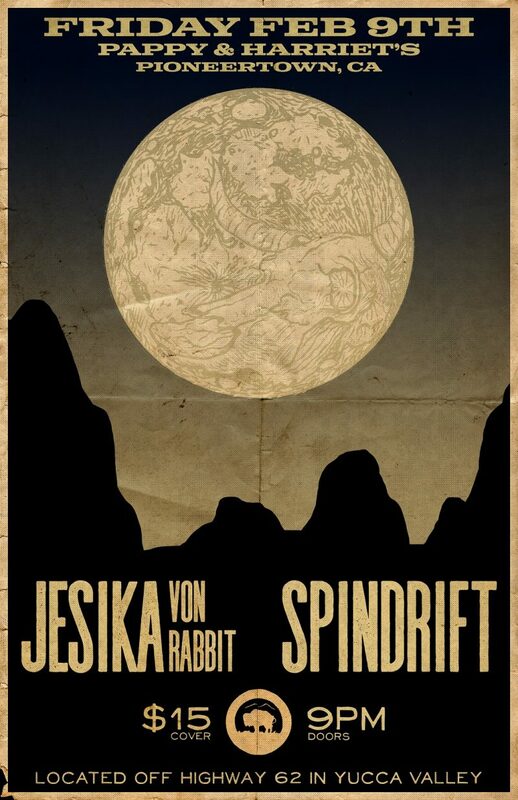 This is Jesika von Rabbit’s first Hi-Desert show of the year. Low Desert sensations, Yip Yops will be opening. Jesika has new songs, and will have a new T-shirt for sale at the show! 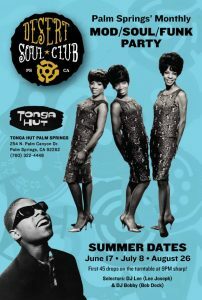 Get tickets at this link – the Facebook event page can be found here. See you there! 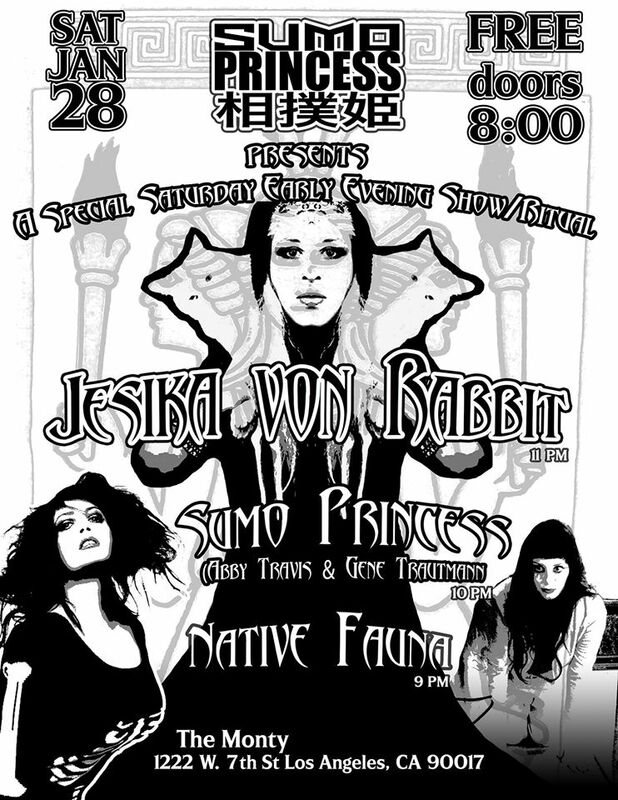 2nite: Jesika von Rabbit – Sumo Princess – Native Fauna @ Monty Bar L.A! Saturday January 28, Jesika von Rabbit, Sumo Princess and Native Fauna at Monty Bar Los Angeles, doors at 8 PM, and it’s a FREE show! 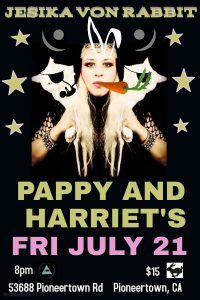 2night: Creepy Creeps w/ Gram Rabbit @ Pappy & Harriet’s! 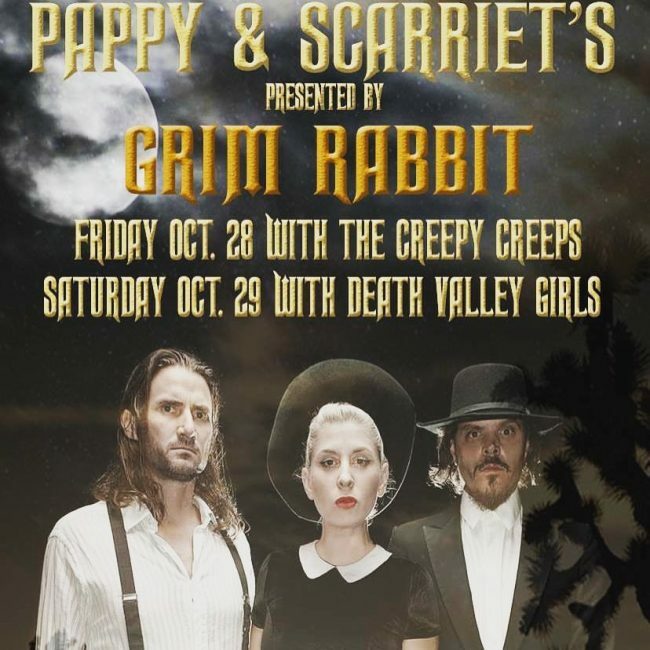 Tonight, 10/28, The Creepy Creeps will be playing Gram Rabbit’s yearly Grim Rabbit at Pappy & Scarriet’s Halloween Weekender! A wild time in the desert is guaranteed for all! Last minute decision to come to the show? Get tickets here or at the door (if there are any left)! 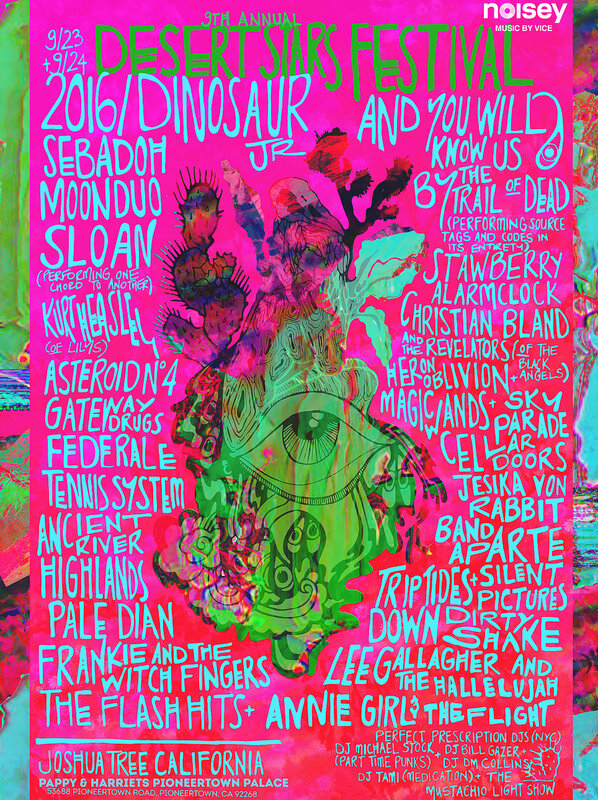 Jesika von Rabbit plays 9th Annual Desert Stars Festival 9/23! Experience the whimsical world of Jesika von Rabbit at the 9th Annual Desert Stars Festival! The Jesika von Rabbit crew including the wonderful and weird Grundles will be performing at this year’s Ninth Annual Desert Stars Festival taking place at Pappy & Harriet’s in Pioneertown, CA.. September 23-24! 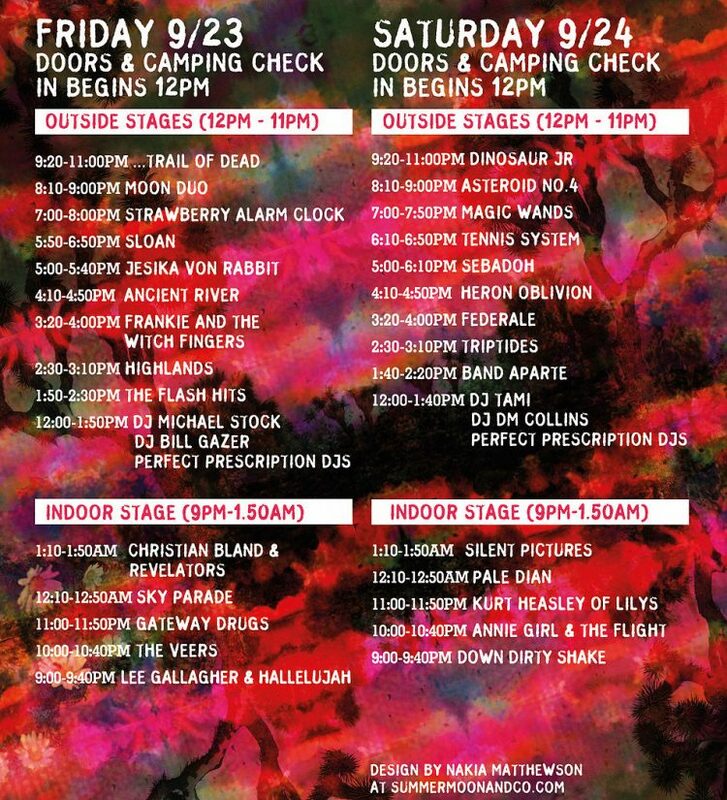 JvR plays on Friday, outdoor stage, 5:00 – 5:40, after Ancient River, and before Sloan, followed by Strawberry Alarm Clock, Moon Duo, and …Trail of the Dead! Weekend passes are available at this link. You can’t beat the Hi-Desert weather this time of year! 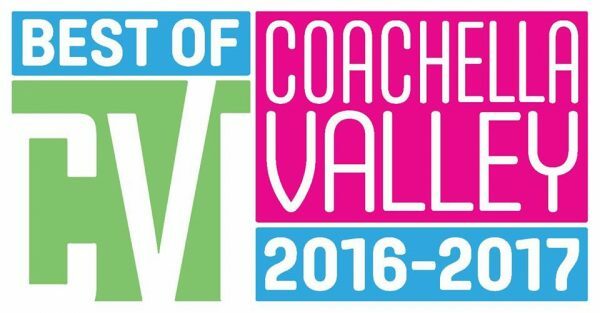 Have a look at the full line-up and schedule here, and we’ll SEE YOU THERE! www.desertstarsfestival.com – Event Facebook page at this link.